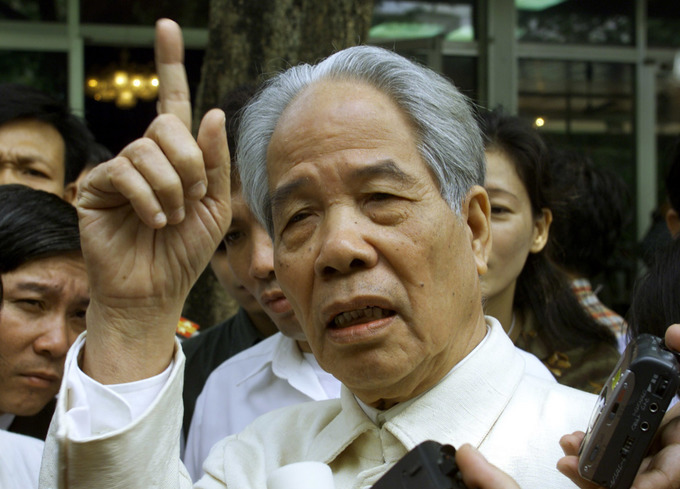 Vietnam has declared two days of official mourning on October 6 and 7 for former Pary General Secretary Do Muoi. After battling ill health for a long time, he died Monday night, aged 101, at the 108 Military Hospital in Hanoi. "In over 80 years of revolutionary activities, Comrade made many great contributions to the glorious revolutionary cause of the Party and the people, received from the Party and the State the Gold Star Order, the 80-year Party membership badge and many other prestigious awards and medals," a joint announcement by top Party and government leaders said. "Comrade's passing is a great loss to the Party, the State and the people," it said. Born Nguyen Duy Cong in Hanoi, Do Muoi was a key figure in Vietnam's revolutionary struggles and its opening up era. He became an active revolutionary at an early age, joining the French Popular Front at 19 and leading campaigns against French colonialists in Hanoi and across northern Vietnam. He served as Vietnam's Party General Secretary from 1991 to 1997, during the country’s transition to a market economy. "Do Muoi presided over the Party at a time when Vietnam began economic reforms that helped build the foundations of sustained economic growth and renewal, lifting Vietnam and its people out of poverty and providing the economic opportunities they continue to enjoy today," Daniel Kritenbrink, U.S. Ambassador to Hanoi, said in tribute to the late leader. "It was during his term as General Secretary that Vietnam and the United States were able to address our shared history openly, advance the process of reconciliation, and establish official bilateral relations in 1995," he said in a statement. During the two-day mourning period, government offices and other public places will fly the national flag at half-mast, and no public entertainment events will be held. Do Muoi will lie in state at the National Funeral Home at 5 Tran Thanh Tong Street, Hanoi, where mourners can pay their respects from 7 a.m. Saturday to 7:30 a.m. Sunday. A memorial service will be held at 9 a.m. Sunday and he will be buried in his hometown in Hanoi's Thanh Tri District at 1 p.m. the same day. Another memorial service will be held at the same time at the Independence Palace in Ho Chi Minh City. The 39-member funeral committee for Do Muoi's state funeral will be headed by Party General Secretary Nguyen Phu Trong and include other top leaders including Prime Minister Nguyen Xuan Phuc, National Assembly Chairwoman Nguyen Thi Kim Ngan and Executive Secretary of the Party's Secretariat, Tran Quoc Vuong.